Are you looking for fun, new opportunities to support the programs at Calvary Women’s Services and make a difference in the lives of women working to overcome their homelessness? 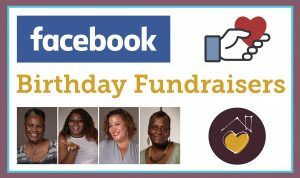 Donate your birthday to Calvary by setting up a Facebook Fundraiser. Since the addition of Facebook’s fundraiser feature back in 2015, individuals and nonprofits have raised over 1 billion dollars through the social media platform. Best of all, it’s completely free! Getting started is easy. Download a copy of our Facebook Fundraiser Toolkit for a step-by-step guide on getting set up, and learn about best practices for getting the most out of your fundraiser. SET UP YOUR FACEBOOK FUNDRAISER AND SUPPORT WOME AT CALVARY!